It’s officially under a year until we get married! Everything is now ‘this will be the last *blank* until we are married!’ I’ve even had my last birthday now as Lauren Meakin – which was actually spent at Coombe Trenchard. We have been so busy planning; being a Coombe Trenchard Bride means a fantastic list of suppliers to choose from! Sarah & Emily have had on hand every supplier I could have wished for and more. The most incredible experience so far in our wedding planning has to be visiting Sarah, Emily & Thirst Choice on my Birthday (September 11th). 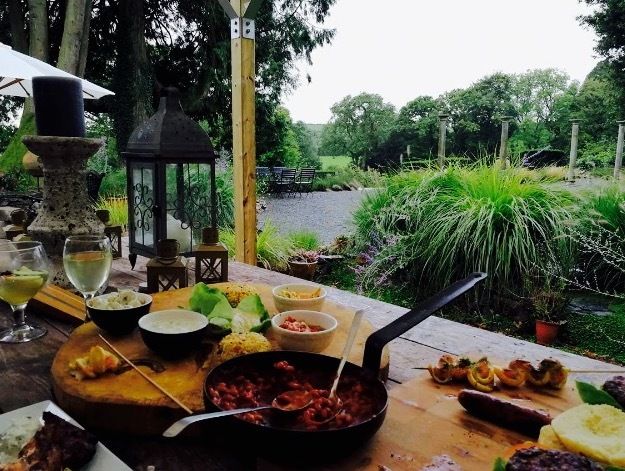 We spent a good few weeks looking over the list of food and drink suppliers, however when we first spoke with Sally and Dave we really felt they got what we wanted, they completely tailored a menu to what we loved and invited us down to see them for a taster at Coombe Trenchard. After we stopped for a birthday coffee and popped into see Tim the vicar (who will be doing our ceremony) we pulled up to be warmly welcomed by Sarah & Emily. It really feels like a second home as it’s already such a huge part of our lives. We were only expecting maybe a doggy bag of food to take away with us for our food tester – but what Sally, Dave & Sarah set up for us was so lovely I couldn’t believe it was for us! We walked out onto the Italian terrace and we could smell the BBQ cooking, we were completely blown away, we tried literally a cocktail of drinks! They were exactly what we wanted but would have never thought of, including Cider Sangria – and the most incredible pink lemonade! After tasting the drinks Dave brought over the BBQ spread and they kindly left us to it, it was the most beautiful experience. 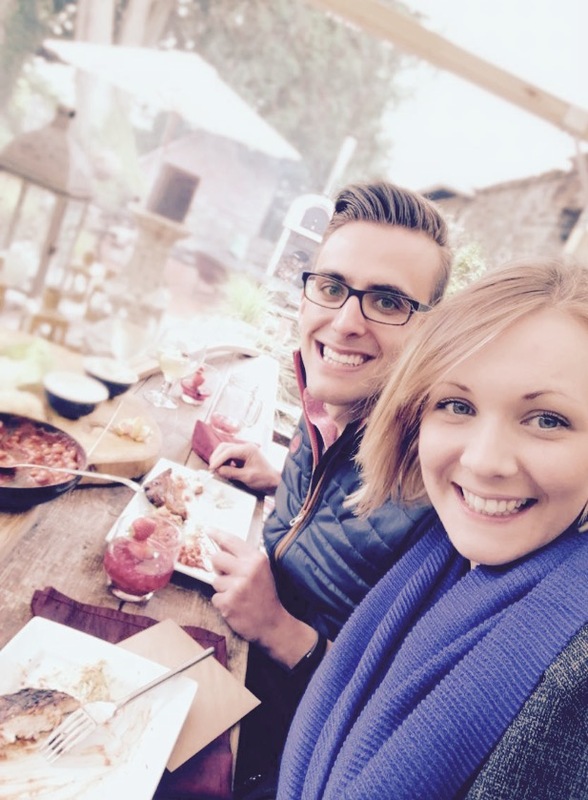 We were sat covered from the rain, overlooking Dartmoor with blankets over our laps eating the most incredible food and drink. The whole time we were buzzing with excitement about how it will feel when we are eating this food on our actual wedding day! The experience was one to treasure, and we now have our catering in the amazing hands of Thirst Choice and have managed to tick another box off of Emily’s spreadsheet! Along with: string quartet, makeup artist, hairdresser, groom and ushers suits as well as my dress, oh yes, did I forget to mention? ….MY DRESS, I can’t say too much apart from I LOVE IT. 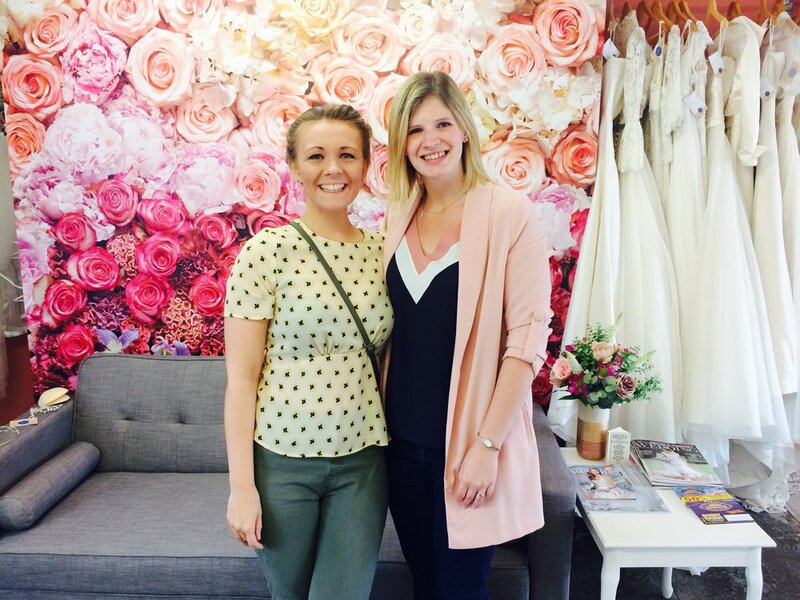 I’ll have to leave it at that until after the wedding when I can share some pictures of it– but I have included a sneak peak of me at the Bridal shop ‘Bridal Boutique’ in Street, with the owner Hannah, who again made my experience so memorable. I really have to say as a tip for any bride and groom, people buy people. It’s so true all of the people involved on our wedding journey are people I will stay in touch with after, because they have all helped to create the memories along the way, which I think is just as important as the day itself. Both Matt & I are on the countdown, the wedding corner is now officially the wedding room and we still have so many more exciting things to plan, our next big milestone will be Christmas and then the start of 2018 – our wedding year! So we will love to keep you updated with a Christmas blog – which might have a little bit of a different feel to it ….